In Our Lady of Mercy Convent School, the girls are encouraged to support charities; both those in Ireland and those in the Third World. Our main annual fundraisers for charities are (i) Team Hope's Christmas Shoebox Appeal; (ii) the 6th Class project (iii) the Easter Raffle. 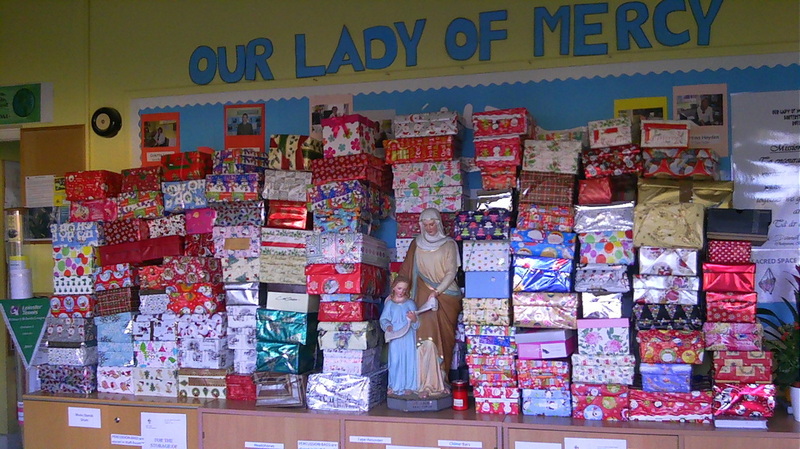 You can see from the photo above that the Christmas box appeal was very successful again last year, with the girls donating a huge number of boxes for needy children in Eastern Europe and Africa. Each year, 6th Class selects two charities to support in Ireland, including always one of the the children's hospitals in Dublin. During 2016/2017, the girls in 6th Class are steering a campaign to raise funds for their two chosen charities: Crumlin Children's Hospital and Merchants Quay. ​This year, they kicked off their project by organising activities at the PA Garden Party in September: nail painting, face painting, games etc. Other activities which have yet to come include a Fancy Dress day at Hallowe'en, Christmas Hands and they are busy knitting Easter chicks. Their funds are building nicely and we also look forward to their big Sale of Work at the end of the school year. Our Third World charity will be chosen by our Student Council members, who are also responsible for selling the tickets for our Easter Raffle.